A new driveway gate is a great way to keep your property secure from intruders and to add to its curb appeal and presentability. It can also help you maintain an element of privacy, preventing unwanted visitors from getting through without your say-so. There are several types of systems on the market, of varying designs and styles, wrought iron fences and swing or sliding gates. Before you decide which one to get, you need to get some answers to a few important questions. How Long Does The Gate Installation Take? Once you chose the type of system that's right for your needs and budget, the installation can take anywhere from one to five days. The time will depend on a few factors such as which type of gate you selected and whether or not you also need to have an opener and an intercom system installed. It will also depend upon whether you are replacing an existing gate or setting up a brand new one where no previous system existed. Access to a power supply will be necessary regardless. Which Type Of Gate System Is The Best One? Which type of gate you should choose is usually a matter of personal preference and specific requirements, but you should take into consideration two major aspects - safety and reliability. Naturally, you'll want the new system to last as long as possible, so you should also consider how much maintenance each option is going to require. As far as safety, both swing and sliding gates have built-in mechanisms that help make them safer. The former, however, does have some dead area when it swings open or closed that can be harder to cover with the safety feature. Overhead gates, while not very common, are an option too. As we mentioned before, when a gate system is installed, there will be safety features put in place to protect your vehicle as it gets in and out of your driveway or parking lot. The safety sensors, which the opener is connected to, are in charge of detecting when a car or a person pass through an open gate and reverse the closing action accordingly, to avoid hitting that person or object. It's important to make sure the opener you're getting belongs to a major brand that's known for its reliable products. Every customer should always be concerned with price. 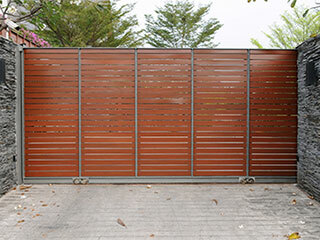 When installing a new gate, your total cost will depend on a number of things. The type of system you chose is the biggest factor, as aluminum models will be cheaper than steel ones, but also less durable. Other influences on price are how much groundwork will be necessary. Will there be a need for digging? Is there an existing power source? Obviously, the more work that's needed to complete the installation, the higher the cost will be. If you need some help making the right decision and considering all the influencing factors, give our team a call.